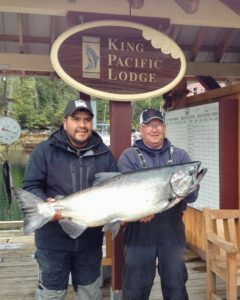 Fishing continues to be very good at King Pacific Lodge! The weather has been fantastic and we have enjoyed calm seas and excellent catches. Cape Mark and Cheney point have been the hot spots in the recent week. Anglers have also been fishing Ivory Island to the north with great results. We’ve been experiencing some large tides recently and this usually results in a better bite on the high or low tide. Our favourite spoon lure, the Gibbs/Delta “Irish Cream” has been working very well trolled behind a red or green flasher. Anchovy baits have been producing with or without a flasher. We’ve had several guests working the tides and first thing in the morning “mooching’ cut plug herring and it seems no matter what we’re offering – the fish are biting. 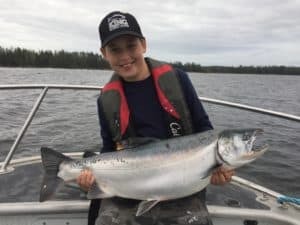 Since opening on the 18th of June the Chinook have been plentiful and while most are in the high teens and low 20’s, we’ve had over a dozen “Tyee” (Chinook over 30 pounds). Many of our guests have inquired into our salmon limits for 2018 and area 7 (Milbanke Sound) remains unchanged. Anglers may retain 4 Chinook salmon and 4 other salmon during their trip. Our professional fish processing crew is pleased to process this into any desired vacuum packaged size. King Pacific Guests have also been enjoying the overall Milbanke Sound area’s other attributes. Kayaking amongst the sea otters was a hit with a family recently visiting from Switzerland. Viewing Killer Whales, Humpback Whales, Porpoise, wolves and bear have all been reported by our guests. Several great dates remain in 2018. Please contact us for additional information. Our 2019 calendar will be out soon. King Pacific Lodge will be changing to a Thursday / Sunday changeover schedule next summer. While many our dates will be filled with repeat anglers from this summer, we welcome the opportunity to review our schedule with new guests. The evening bite! Guides Connor and Ronnie with a beautiful Milbanke Sound Tyee. We have many excited guests booked for this season and asking about the first fishing. We’re happy to report the season has started off very well. Our winter and spring were spent replenishing supplies, repairing equipment and preparing for our fifth season of operation. This included towing the King Pacific Lodge to North Vancouver BC for hull maintenance. 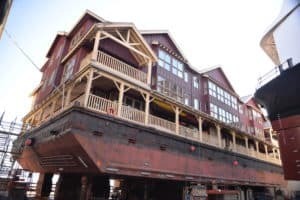 Seaspan Drydock lifted the 1600 ton lodge out of the water and did a great job restoring several areas for the longevity of this floating facility. Our fishing fleet of Ironwood and Northwest boats was shipped to Vancouver Island for repainting, re-powering with reliable Mercury engines and improvements to wiring and navigational equipment. King Pacific Lodge is pleased to announce our new fixed wing flight provider: Air Tindi. Their comfortable Dash 7 features 40 seats, four engines and is perfect for flying all of our guests at one time to and from Bella Bella. The Heljet Sikorski 76 whisks our guests directly to King Pacific Lodge. HeliJet Sikorski 76 and the powerful Dash 7 operated by Air Tindi. After towing the lodge back to St. Johns Harbour we are now hosting our second group of guests. Everyone has been enjoying calm seas and truly excellent fishing. Since opening on the 18th of June we’ve been fishing Cape Mark and Cheney Point. Chinook salmon in the 15-20 pound range have been the norm for most anglers. Highlights have been six “Tyee” Chinook to date (over 30) with the largest being 36 pounds. A few Coho have been showing as well, generally about 8-10 pounds at this time of year. Look for these Coho to increase in both abundance and average size by the end of August. Salmon have been biting on the tides, and either early AM or late PM. Our standard KPL green, red and UV flashers produced by Gibbs tackle combined with a green spoon or Anchovy bait has been working best. Fishing tight to the shore and along the kelp at 45-70ft, and within 100ft of water seems to be the best producer. Some of our guests have also been mooching Cheney Point with cut-plug herring and enjoyed great results. Bottom fish such as halibut, ling cod and rock fish have been plentiful. Most halibut have been in the 10 – 20 pound range. 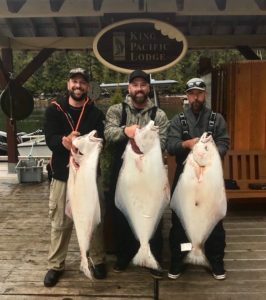 Shown below is a lucky trio with halibut closer to 30 and 40 pounds. Similar to the best sport teams, we’re very proud of the crew assembled for our 2018 season. We have an exciting lineup of seasoned fishing guides and some truly talented and welcome new faces on the water. Our catering and inside services crew is eager to provide the finest of comforts away from home. Should you have any questions about our fishing and adventure packages please contact us anytime. Select dates are still available for this season! As we approach 2018, we would like to wish all our guests, crew and suppliers the very best for the Christmas Holiday and New Year. 2017 was a huge success for King Pacific Lodge and we’re looking forward to 2018! Thank you to all who have been guests at King Pacific Lodge. We very much appreciate your support! Since the end of the season, we have been working hard to ensure the King Pacific Lodge guest experience is better than ever! After our fourth season of operation, we towed the lodge and staff barge south to Vancouver Island. Here, the lodge will undergo several operational improvements. Our fleet of custom made fishing boats have also been brought down and will have upgraded electronics, paint and engines. The King Pacific Lodge facilities require a tremendous amount of maintenance and we must ensure we are entirely self-sufficient during our operating season. Aside from the fishing tackle and boats, this includes everything from power generation, fuel storage, water filtration and all kitchen equipment. The 2018 season planning is underway and we’re looking forward to seeing so many new and return guests. Many of our experienced crew have contacted us and have confirmed their desire to spend the summer again at Milbanke Sound. We have several, exciting new crew members joining us and all looking to get back on the water! We have attended several post season meetings with Canada’s Department of Fisheries and Oceans. British Columbia’s Central Coast, where Milbanke Sound is located, provided the very best fishing opportunities on the coast in 2017. We anticipate this trend to continue and expect very good fishing in 2018. Operationally, we will be changing our air transportation to and from Vancouver. 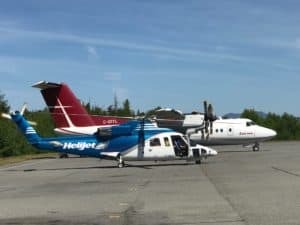 Ensuring our guests are arriving and departing on time is paramount and a larger, single aircraft “Dash 7” option has presented itself to transport all guests. Having such great fishing sometimes increase our outbound weights and our goal is to ensure all guest’s fish and baggage arrive with them, on time at the end of a great trip! 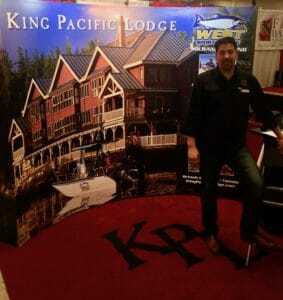 The popularity of King Pacific Lodge has proven to be far greater then we could have ever imagined. Built for 34 guests only, we feel this is the perfect size adventure lodge and where we’re able to spend quality time with our guests in an uncrowded, attentive environment. Should you be looking for that special trip in 2018, please contact us soon. Again, from all of us at King Pacific Lodge we wish you the very best for 2018 and look forward to staying in touch! Fisher Cuthbert’s 19 pound Coho! A personal best. 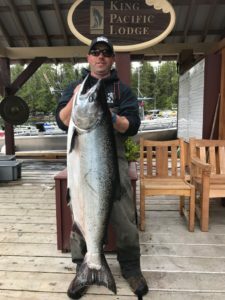 Late August and early September fishing continued to produce excellent results for King Pacific Lodge Anglers. Fishing continued to be very good until our last day of the season, September 4th. The weather was excellent and providing calm seas and some beautiful sunrise and sunset fishing. 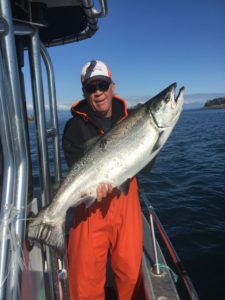 Coho salmon were at the top of the list for action packed days on the water! Ivory Island, Cheney Point and Cape Mark were the favourite places to fish. Many of these fish were often well over 15 pounds and several topping 20 pounds! Chinook continued to be available during early September with many Tyee coming in over 30 pounds. While not as abundant this time of year as our previous two years, there was plenty of opportunity for everyone to experience the thrill of these large salmon. 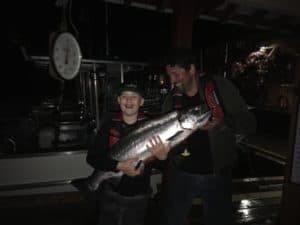 Congratulations Chris on an incredible 19 pound Coho! Salmon in general were more likely to hit artificial baits during the latter part of our season. flasher and white “Hoochie” (squid), flasher and the custom KPL “Irish Cream” spoon and a combination of other fast trolled, silver and white spoons also worked well. Guests of KPL were delighted to have Humpback Whales feeding right within our fishing areas. The abundance of baitfish around Ivory Island were attracting both salmon and these large mammals, creating quite a show. We’re now finished the 2017 season and what a success! Fishing in general was very good, and probably the best we’ve seen in our fourth year of operation. Salmon showed early in good numbers and the fishing was very consistent the duration of our season. In addition, the weather was excellent – albeit not always as dry. The winds stayed calm and our regular fishing areas were very comfortable for fishing and enjoying the waters of Milbanke Sound. We’d like to Thank all guests who fished with us this year and we’re looking forward to seeing you again! Thank you to all of our staff and suppliers – we’ve enjoyed another safe season on the water. We’re currently towing our lodge and boats south for some exciting upgrades and improvements. Look for an even better experience in 2018. Should you be looking for the adventure of a lifetime and would like more information about our 2018 King Pacific Lodge program please contact us anytime. August Anglers have had an incredible time on the water! 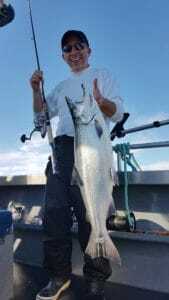 Exciting Coho action has complemented our great Chinook fishing. Add to this the relatively calm waters and overall pleasant weather for a truly enjoyable sport fishing vacation. 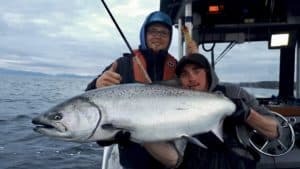 Highlights of August include many Tyee (Chinook over 30lbs) including the largest to date at 60 pounds taken by Casey and guided by Mark. Congratulations! Coho tend to be quite a bit larger at this time of year. We’ve had many now well over 15 pounds with the larger in the 18 pound range. Cape Mark, Cheney Point and Cape Swain continue to produce good numbers of fish. 45 ft seems to be the right depth and trolling Flasher Anchovy, Flasher Spoon or, as fishing guide Troy Hogg found out – a piece of celery placed correctly in a teaser head will catch a fish! 2017 has proven to be our best season to date. Fishing has been superb and we’re looking forward to more exciting action as we roll into early September. Salmon fishing continues to be simply Awesome! Congratulations Jack on your 56 pound Chinook! Aside from the extra large sized Chinook, Anglers have been catching a steady stream of 15 – 25lb Chinook. Coho have also been increasing in both abundance and average size. To date, the largest Coho is 18 pounds! Our local hotspot of Cheney Point has been producing the best action. Fish are biting between 30 and 45ft. Spoons, hootchies, anchovy and large whole or cut plug herring have all been working well. Cape Mark, The Notch and Ivory Island lighthouse have all been producing as well. 5 inch herring, squid and needlefish are all local feed keeping the salmon focused o the Milbanke Sound fishing area. We’re starting to see a little shorter days on the water now and guests can expect to be on the water just before 6am. This has usually provided the best bite in the day, often lasting several hours. Some Anglers have reported as many as 20 fish per morning. Excellent action! Local wildlife abounds. Both Killer and Humpback whales, Seals, Sea Lions and several local Sea Otter have been entertaining guests on the water. Should you have a trip coming up and require any additional information please contact us anytime! Weren’t able to book a trip this year? Please stay in touch and we’ll do our best to fit you in on your preferred dates in 2018. 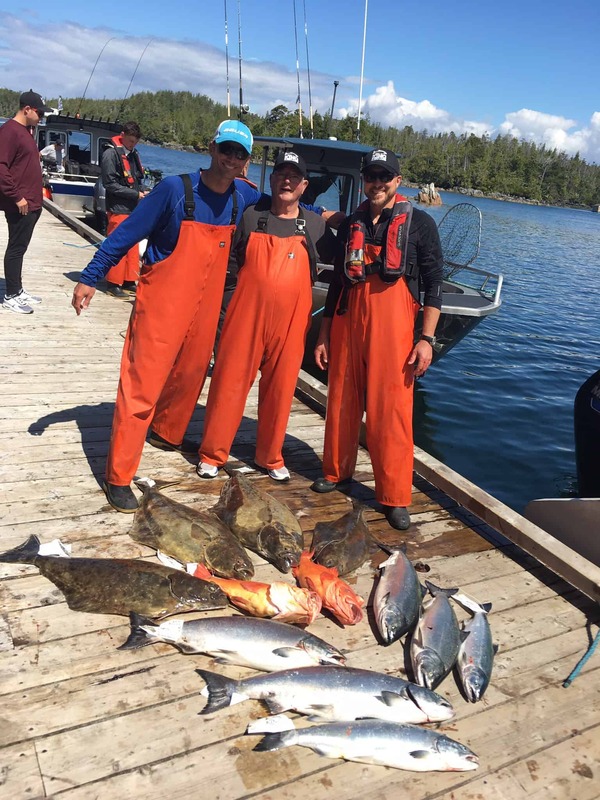 August is well upon us and Anglers at King Pacific Lodge have been enjoying both excellent fishing and weather. Chinook/King salmon action has been far better this year than previous. Coho / Silver salmon continue to be more and more abundant with excellent average sizes topping 12 pounds. This past week provided some notable large Tyee (Chinook over 3o pounds) including several in the 40’s and mid 30’s. Our largest last week was 43 pounds! Cheney Point, Cape Swain and Cape Mark have all been top producers. The flasher / Anchovy combination has been working very well this season, we’re starting to catch quite a few on either whole herring or cut-plug baits. Depths appear to be a little shallower on average and the lucky depths of 37 / 47ft seem to produce the best. This is a great time of year to try “mooching’ whereby a bait is fished behind a 6oz weight without the use of a downrigger. The custom “KPL” Irish cream spoon from Gibbs/Delta tackle has been working very well when trolled behind a flasher. All fishing areas are showing a healthy population of baitfish including herring, needlefish and squid. At times, bait-balls are 100ft deep and often spread out over the water hundreds of feet. Herring are typically smaller this year and we’re finding most to be 4 and 5 inches at the cleaning table. 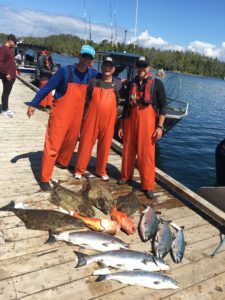 KPL Anglers continue to comment on the quality of fishing experience at Milbanke Sound. Our exclusive location provides a productive fishing area with very little pressure and the ability to find miles of coastline to fish all on your own. All within five minutes away! King Pacific is so much more than fishing! Enjoy Chef Luke’s amazing meals during your stay, go kayaking, rowing or utilize our spa now featuring two RMT (Massage Therapists). Marine nature viewing opportunities are endless. Killer, Humpback and Sei whales were all viewed this week along with Sea Otter, Sea Lion, Seals and an abundance of bird life. For those guests who fished with us in 2017, it was a pleasure to see all of you out on the water! We’re already booking for 2018. If you were sadly unable to fish this year due to lack of availability please email or call early for next season and we’ll do our best to find space during your preferred dates. Anglers at King Pacific Lodge continue to experience the best fishing on the coast of British Columbia. Since the start of our season in mid June, Chinook / King salmon catches have been excellent. Coho / Silvers have been in very good numbers for a couple of weeks now and they continue to grow in size. Hot spots continue to be Cape Mark and Cheney Point. Flasher and Anchovy has been the most popular combination and many of the guests and guides are swapping over to Flasher and Hoochie; particular the green spatter back squid. 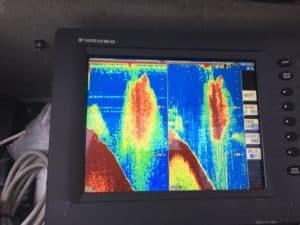 Depths appear to be shallower than previous seasons with many fish being taken in the 30ft range. 30 – 60ft deep is the usual depth for fishing. Water temperatures continue to be cooler and more favourable with a regular 56 degrees. In previous years we’ve seen upwards of 62 degrees – a little too warm. The trip finishing today enjoyed calm seas and sunny skies for the duration of their stay. This allowed access to all of the regular fishing areas including those out of our usual range. Tyee Chinook topped 44 pounds this week along with several other low 30’s and a 38 pounder. Most Coho have been in the 9 pound to 13 pound range. Large schools of herring are present and keeping fish feeding through the day. Squid have now started to appear and perhaps the reason Hoochies are working very well. Milbanke Sound continues to be a popular spot and King Pacific Lodge guests enjoy its exclusivity. Many guests are commenting on the serenity and productivity of the area, particularly because there are no other lodges within the area. Should you be looking forward to a trip in July or August and have any questions or require additional information please contact us anytime. Our calendar for 2018 is soon to be released and we encourage all who are interested for 2018 to communicate with us as soon as possible. Early July is upon us and the we’re enjoying great weather and excellent fishing. The past week provided calm northwest winds and easy, comfortable access to all of our fishing areas. Chinook and Coho salmon appear to be in very good abundance this year. KPL opened June 12 and Anglers have been experiencing consistent catches at most of our regular fishing locations. Several of our larger Chinook almon have been over 40 pounds with the largest being 46. The largest Coho to date was caught just yesterday at 15 pounds. Cheney Point, Cheney 2 and Cape Mark have been hot spots. Popular baits have been both anchovy and flasher or flasher and spoon – anywhere from 40 to 80 ft deep. We’ve been noticing 4 – 5 inch herring, squid and needlefish in the bellies of the fish we are cleaning. It’s usually at this time of year where we start to fish a variety of different “hootchies” (artificial squid baits). These can produce incredible results and are easy to fish. Wildlife encounters have been numerous. Killer and Humpback whales, Porpoise, Sea Lions and Sea otters are all a regular sighting. Many guests are choosing to take our our ocean kayaks for an evening paddle. Our 17ft Tyee rowboats have also been outfitted with 6hp Mercury outboards and we’re looking forward to our first Tyee Chinook (over 30 pounds) to be taken while rowing. If you’re visiting KPL this season we hope you give this historic form of row boat fishing a try. Its always a pleasure to see so many repeat guests who book with us each year. Both new and existing guests often comment on the calm, protected waters and the fact there are no other fishing lodges in the area. Our fishing grounds are very close to the lodge and unlike other areas, not crowded with too many boats. If you’re visiting KPL this year, plan on some great fishing and camaraderie among friends. We’re looking forward to seeing you.